Editor's note: At his request, the subject of this profile wishes it to be known that the content and implications presented here are not an accurate picture of his current views. BOB ABERNETHY, anchor: You might think someone raised a Christian fundamentalist in Texas would not fit in well at the skeptical NEW YORKER magazine. But we have a story today about Matt Diffee, a NEW YORKER cartoonist, who is doing just fine -- making people laugh in spite of a lot of rejection. Each month in New York, cartoonists, comedians, and other humorists show off the work they did that no one wanted. They call it The Rejection Show. 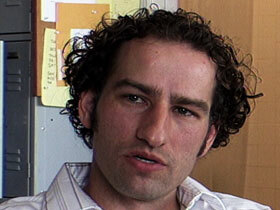 THE NEW YORKER receives about 1,000 cartoon submissions a month and publishes perhaps 20. MATTHEW DIFFEE: So we're cartoonists at THE NEW YORKER, which sounds like a really good thing and a really cool gig, and it is, but there is a lot of rejection involved. This is last week's reject. It's a restaurant, a fancy restaurant, and there is this announcement: "Will the owner of the black Humvee in the parking lot please get over themselves." We go in every Tuesday with 10, 12 ideas, and on a really good week we sell one. ABERNETHY: Matt has sold about 50 cartoons to THE NEW YORKER, where the average pay for a drawing is $675. Before Matt became a cartoonist, he studied to be a missionary. Mr. DIFFEE: I was in high school. I had a really tight group of friends that were all very serious about our Christianity and our faith. I did want to go into the ministry because I thought I would be a preacher, more specifically a missionary. That seemed cooler -- had an image, I think, of Indiana Jones with a Bible. ABERNETHY: But Matt decided his greater gifts were as an artist who could make people laugh. Mr. DIFFEE: It'll just be God sitting at a table sorting through two piles. I always get a lot of ideas on Tuesdays, because I'm kind of ramped up from getting my batch together. There is an In box and a Hell box. I'll probably do it for next week. It shows God sorting through piles, I guess just a pile, putting things in the In box or the Hell box. It's inappropriate; my mom won't like that. That's not going to sell, probably. Cartooning is pleasing to God because he gave me some skills and some talents and some interest in that department. ABERNETHY: Matt grew up outside Dallas, the son of an airline pilot. Mr. DIFFEE: Yeah, this is the family meeting, and the Dad is saying, "And before we begin this family meeting, what if we say our names and a little something about ourselves." He is not often at home. My dad was a big influence in a lot of ways, just as far as being sort of an individual and a creative guy. My mother is very religious. I like the slippers on her feet; it's the kind of slippers my mom wore all her life. My mother is outwardly religious, socially religious. She's been in church all my life, and that's probably the biggest influence toward Christianity in my life. 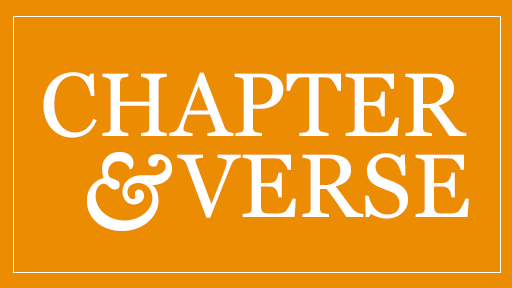 The Christianity that I grew up in is very Bible-based. The first, probably starting belief is that all of the Bible is completely inspired. It's actually kind of easy, in a way. You can just -- the Bible says it. There it is. I was real dogmatic about things when I was 17. 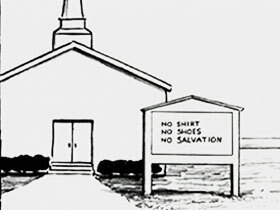 I did a cartoon of a church with a sign out in the front that says, "No shirt, no shoes, no salvation." It leans toward a deeper message about legalistic, fundamentalist churches that have confused the list of rules with Christianity. ABERNETHY: Matt graduated from South Carolina's fundamentalist Bob Jones University. Matt Diffee is a NEW YORKER cartoonist making people laugh in spite of a lot of competition and rejection.